Captain Toad: Treasure Tracker is an Event Course in Super Mario Maker, released on December 24, 2015, and based on the game of the same name. It unlocks the Captain Toad Mystery Mushroom costume upon completion. The level begins in an area with many Boos. It leads off to a segment with lifts, and a P Switch that Mario must hit to get a Super Star from a ? Block and take out a Hammer Bro. 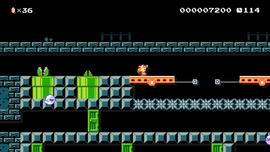 A Warp Door is reached, and after being entered through it Mario must take the left Warp Door and continue heading left to an area full of Piranha Plants, lifts moving over spikes, and the Goal Pole. Search every angle in a puzzling adventure! In Captain Toad: Treasure Tracker, the Toad Brigade's lovable Captain explores a variety of miniature Mario courses. And now he's tackling a real Mario course in search of shiny golden coins! Usually Captain Toad can't jump with his heavy backpack—can you clear this course without jumping? Susume! Kinopio Taichō The Japanese name for Captain Toad: Treasure Tracker, "Advance! Captain Toad". This page was last edited on February 7, 2018, at 14:38.